This is a gorgeous box I made as a ‘thank you’ gift for my cousin (naturally, with a few choice chocolates inside! ), who hosted a stamp-a-stack for me (the cards in the post below, actually!). Thanks, Janelle! I made the box from the Sweet Nothings Simply Scrappin kit (the papers are just lovely in this kit), plus I used the flowers from Together Forever which I hand-cut out and stuck a red rhinestone brad in the middle, for the three “buttons” down the middle. The colours I’ve used were based off the Sweet Nothings paper, so I used Kiwi Kiss and Riding Hood Red. There are great instructions to makea Box in a Bag here. It was really easy to make, albeit a tad fiddly! These are the cards I designed for my last Stamp-a-Stack. One of the ladies coming along wanted to make a wedding card, so I tailored the SAS around Tempting Turquoise and Basic Grey. I thought the Tempting Turquoise lended a real “Tiffany’s” feel to the card … what do you think? And the second card was designed for boys 🙂 And, so, you can see how a simple layout and colour scheme can be used for two entirely different cards. The stamp sets I used for the wedding card were Fun & Fast Notes, Together Forever and Sincere Salutations. Although you can’t see the Sincere Salutations, it was an option for anyone who wanted to make another type of card with Fun & Fast Notes and Sincere Salutations. The boy’s card used the stamp sets Choo Choo (available in the Spring Mini), Short & Sweet and Fun & Fast Notes. I really love this card. The colours are pretty and the elephant is adorable! I was completely inspired to make it from a gorgeous card on SCS, which you can check out here. The colours I’ve used are Riding Hood Red, Pink Pirouette and Kiwi Kiss. The paper is Riding Hood Red and the DSP from the Simply Scrappin Kit, Sweet Nothings. What a useful Scrappin kit Sweet Nothings is! Of course, you already knew it, but I’ll say it anyway, the elephant is from Wild About You :), and what you may not know is that the sentiment is from the Level 2 Hostess Set, Occasions for All. The party hat was a useful idea I came up with … cutting a triangle from my Sticky Cut Letters adhesive and adhering Fine Supernova Glitter on the party hat topped with a Circle Fire rhinestone brad – and three of the same brads on the top left corner of the card. This is a card I made for a very special little girl, who was having a Rainbow Bakery party for her fifth birthday. All the kids mixed up their own cupcakes at the party, so I thought Big Bold Birthday perfect for her card. I also used the new DSP Walk in the Park and based the colours around that gorgeous paper (available in the NEW Spring Mini catalogue). So, the colours I used? Cameo Coral, Basic Grey and Baja Breeze. This is a card I mocked up for a friend for a kitchen tea invitation early last month. Seeing as tri shutter cards are all “in” at the moment, it was a pleasure to make it! And, I was able to use some Spring Mini DSP paper – Parisian Breeze. The DSP is simply gorgeous, you must try it! Now, this tri shutter differs slightly from the tutorial on The Craftiblog here. It’s a gorgeous card on The Craftiblog, by the way 🙂 Check it out! I had to alter the measurements for my card, as I wanted it to be made from an A4 piece of paper, instead of 12×12. The reason? Simply, the card was designed for an invitation and it would be more cost effective if made on A4 paper. I’ve used a base paper of Sahara Sand. Then I have stamped the big swirl from Baroque Motifs on Vellum paper in Versamark ink and heat embossed it with white embossing powder. I also used the same stamp in Chocolate Chip ink on the Parisian Breeze DSP – which I then used my square punches to punch out for the small square panels. The panels, except for front panel, have all been layered with Chocolate Chip paper. I stamped the “you’re invited” from Sincere Salutations on Whisper White paper and then punched it out with the large oval punch, layering it with Chocolate Chip paper with the NEW scalloped oval punch (available also in the Spring Mini). The ribbon is the coordinating Kraft taffeta ribbon – love it, such a versatile ribbon! The close up below barely (sorry!) shows that I have stamped the champagne glasses from Cheers to You in Sahara Sand on the Sahara Sand paper, under the Vellum paper. I have a tutorial in my monthly newsletter this month on how to make this particular tri shutter card on A4 paper, so if you’d like to make your own tri shutter, join up now (click on box at top of right hand margin)! AND, if you do make your own, why not post a link to it in my comments? I’d totally love to see your creations 🙂 If you don’t have your own blog, then you can always post your picture in Splitcoaststampers here (clink on the Upload a Card link), and then paste your card’s link in my comments. Choo Choo … the Spring Mini is here! 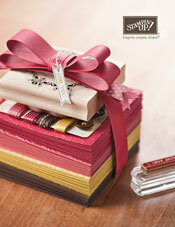 Well, today is the first day of Stampin’ Up!’s Spring Mini Catalogue. You can view it online here. I think the Mini is inspirational this year, with lovely colour combos, stamp sets with a reasonable price tag and exciting accessories! This card uses the new stamp set, Choo Choo, a must for anyone with little boys! But, as you can see, it is also a great Christmas card. To add a Christmas element, I’ve used the stamp sets, Spotlight on Christmas, Best Yet, and Short and Sweet. The colour combo is Old Olive, Chocolate Chip, Real Red and Baja Breeze – inspired by the new DSP in the Spring Mini, Ski Slope. Of course, a little touch of sparkle makes a great Christmas card, and to do this, I used Tombow glue and SU White Chunky Sprinkles. If you would like to place an order from the Spring Mini from anywhere in Australia then email me today.